Barnet have sacked manager Mark Stimson following Saturday's 2-1 home defeat against Aldershot Town. The result leaves the Bees in the League Two relegation zone, although only behind 22nd-placed Lincoln City on goal difference. Former Stevenage and Gillingham boss Stimson, 43, was appointed at Underhill in June but won just five of his 26 games in charge. 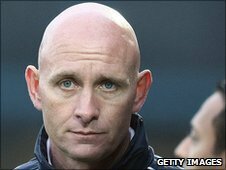 Former Bees manager Paul Fairclough has been named as caretaker boss. Stimson told BBC London 94.9: "On a personal note my contract has been terminated as we speak. "I wish the club all the best for the future, whoever takes over has an honest bunch of players, young and a bit naïve but they give everything they can. "I'm gutted but have to accept it - we didn't imagine to be here after 22 games and I have to respect the chairman of the football club and his wishes"